When we performed our first global assessment in 2012, we did not know data science had deliberate practices and open tools that could help us work with data. Instead, we were involved in the painstaking process of preparing 100 different data sources in Excel and meticulously tracking every step in a 130 page supplemental document. Fast forward one year, we repeated this detailed and labor-intensive process for the 2013 assessment and soon realized our approach needed to change. We turned to open data science tools, such as R, RStudio, and Github, to prepare and analyze our data. The process streamlined our workflow and in 2014 enabled us to develop the OHI software Toolbox that allows for repeatable and reproducible results year after year. This approach allows us to perform better science in less time. In 2012, it took 30 people 3 years to complete the first assessment, and in 2017, it took 1 person just 3 months. By fine-tuning our process and developing step-by-step training guides, we set ourselves up for the holy grail of science: reproducibility. And this year, reproducibility goes beyond our core team and into a new realm with the initiation of our OHI Global Fellows program. The OHI Global Fellows program will train masters students in data science best practices and the OHI Toolbox, preparing them to lead the annual global assessments. This provides the perfect opportunity to test the ease of use of our workflow and training materials, which are all available online: Introduction to data science and Introduction to the OHI Toolbox. In addition to the Global Fellows, these training materials are used by our OHI+ program, including groups in Mexico, Kenya, Tanzania, and Indonesia. This year, our OHI Global Fellows are all masters students at the Bren School for Environmental Science & Management at the University of California Santa Barbara. They will be mentored by the OHI team at the National Center for Ecological Analysis and Synthesis (NCEAS) to learn about the OHI framework and how to weave open data science principles into marine science and conservation. After being trained alongside their studies during the school year, they will work full-time this summer to conduct the 2018 OHI Global Assessment. 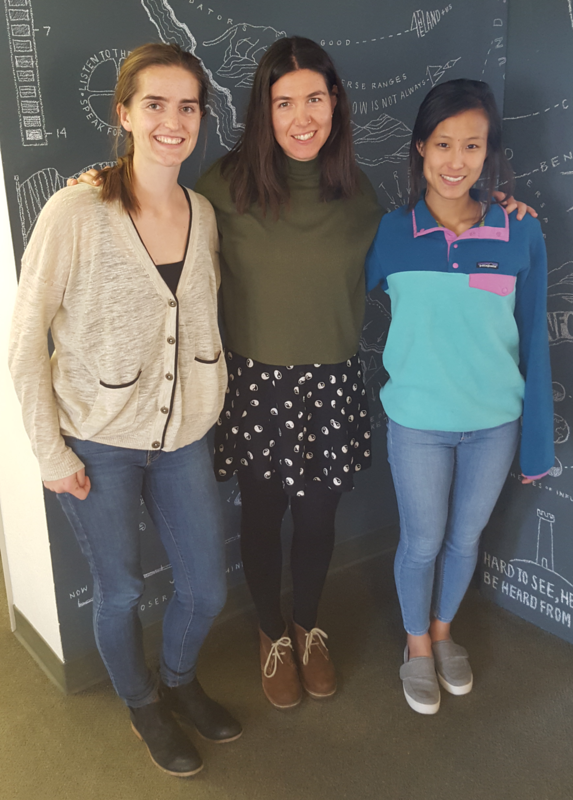 So, without further ado, meet our three inaugural OHI Global Fellows: Ellie Campbell, Iwen Su, and Camila Vargas! From left to right: Ellie Campbell, Camila Vargas, Iwen Su. Ellie - originally from Alaska - comes to the fellowship with a love for environmental data. She was a math major in undergrad and became more immersed in the statistics and environmental data analysis world in grad school. With an interest in the application of data science to environmental conservation efforts, what attracted Ellie most to the fellowship was learning how to take messy data and turn them into actionable policy items. Along with this, she hopes to learn science collaboration tools and how to best utilize them to enable effective teamwork. Iwen - originally from California - first realized she wanted to be involved in marine science after reading Ring of Endless Light, a book involving a girl and her connection to dolphins. Once in the marine science world, she realized a lot of people around her were learning this thing called R. She found teaching herself to code challenging, so she accepted an internship with the Arctic Data Center at NCEAS where her interest in data science truly began. With interest in spatial management of fisheries and aquaculture, Iwen saw this fellowship as a great opportunity to meld her two interests: data science and ocean management. Through the fellowship she hopes to further strengthen her data science skills while learning best practices for collaboration and new data visualization techniques. Camila - originally from Chile - knew she wanted to be a marine scientist after scuba diving for the first time and seeing life underwater. Coming from a marine science background, she realized everything always related back to data even if there were not always the resources and capacity to analyze it. Camila views data science as a way to develop applied solutions with real world applicability. She is interested in the nitty-gritty details of how OHI is calculated and also how results can be used to focus management efforts. She is excited to become well-versed in the R world through hands-on learning and working in a cloud based platform, and applying these skills to her interest in socio-ecological systems in small scale fisheries.